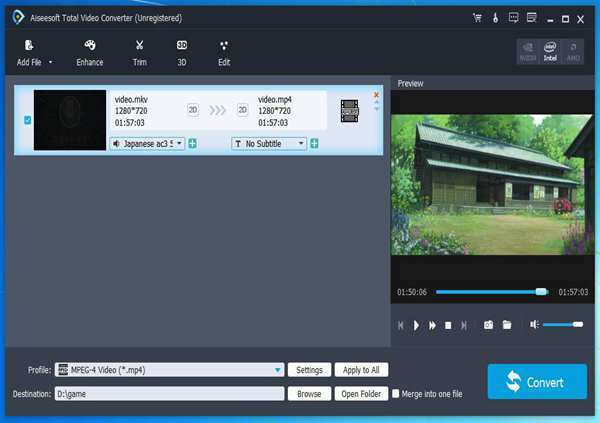 Frame Rate Converter: Change Frame Rate of Video in Batch FPS Converter: Change Frame Rate of MP4, AVI, FLV, AVCHD, MPG, MKV etc. Why does Frame Rate Matter? Generally, frame rate is related to the style and viewing experience of a video. The higher the frame rate is, the better the experience of your eyes. So in order to get better video user experience, frame rate changing comes first. Frame rate, also expressed in frames per second or fps, includes several kinds: auto, keep original, 10, 20, 23.97, 24, 25, 29.97, 30, 50i/p, 60i/p, 72p, 120p, 300p fps. 24fps provides more convenience with less storage space and can be found in converted film. 25p is suitable for equipment recording and smooth video playing and is common seen in courtiers like U.S, Canada, and Brazil etc. 30fps is match for computer monitors. 60i fps gives out a better resolution and is used in shooting fast actions like sports or other action scenes. In one word, frame rate lower than 30fps is usually used in movies and TV shows. 60fps frame rate is mainly found to create slow motion video or to record video game footage. Users can adjust frame rate themselves according to the specific usage. There is one thing should be noticed: low frame rate produces small video size with less disk space while high frame rate gets big video size with more disk space. How to change video frame rate from auto to 60 or to 23.97fps, 24fps, 25fps, 29.97fps, 30fps, and more? I have a 200fps videos with big space taken. I do not have enough dis space. Can I change it to a smaller file? I have movies on computer but I want to sync it to TV. My computer and TV shows different frame rates. Is there a way to change frame rate between them? These are just some common samples of changing frame rate. If you are troubled by frame rate changing problems, please comes here to find your answers. This article will shows a step by step guide on how to change video frame rate and all kinds of frame rate problems with a wonderful frame rate converter. Change frame rate among auto, keep original, 23.97fps, 24fps, 25fps, 29.97fps, 30, 50i/p, 60i/p, 72p, 120p, 300p fps and more. 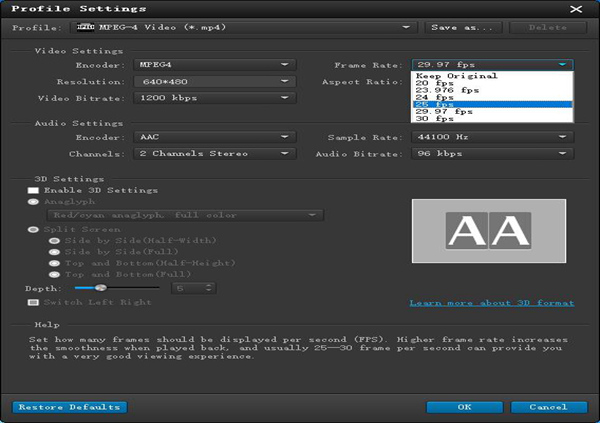 Change frame rate of MP4, AVI, VOB, FLV, MOV, MKV, SWF etc. and other thousands of vide audio formats with simple steps. Change or convert among all kinds of video audio formats in batch with high quality. Enhance video audio formats like rotate videos, add 3D effects, crop videos, merge or split videos, add effects, add watermark or subtitle, enhance videos, upscale resolution, optimize brightness and contrast, remove video noise, extract audios, adjust bitrate, audio channel, sample rate and so on. Follow the detailed guide to change your frame rate with a professional FPS converter here easily. Free download Frame Rate Converter (For Windows, For Mac), and then follow the steps as bellow to finish Frame Rate conversion. Click “Add File” button to load files into frame rate converter. Find “Profile” drop down button and set the format you want. Click “Setting…” -> “Profile Settings” -> “Frame Rate” and select the format as “Keep Original” “20fps”, “23.97fps”, “24fps”, “25fps”, “29.97fps”, “30fps” and so on. Click “OK” button when you finish. Click “Convert” button to change frame rate with ease. When the conversion is done, click “Open Folder” button on FBS converter to get the files. You will never ever be troubled by frame rate problems any more with this good frame rate converter. Why not free try it to get your frame rate experience right now? This entry was posted in Videos and tagged adjust frame rate, change audio frame rate, change avi frame rate, change mp4 frame rate, change video frame rate, fps converter, frame rate conversion, frame rate converter, how to change video frame rate. Bookmark the permalink. ← R3D File Converter – How to Convert and Play R3D Videos Successfully?